Bumps around the eye area can sometimes look like hard, pearly acne. Although it's most common in infants, adults can occasionally suffer from these annoying yet harmless bumps. By understanding the causes and symptoms of those bumps, you can better understand how to prevent and treat the bumps to get rid of them and keep them away. Bumps around the eye likely manifest as hard, pearly and whitish bumps that can become reddened when irritated. The bumps are typically 1mm to 2mm in diameter, notes SkinSight.com. Bumps are typically not itchy or irritating but can be unsightly and embarrassing. 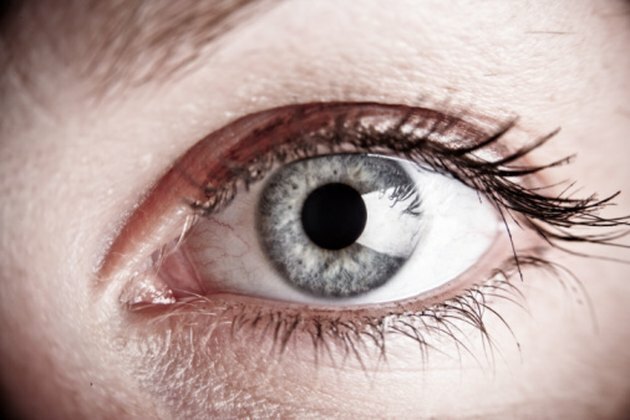 The cause of the bumps around your eyes is likely milia. Milia are small, white-to-yellow bumps that appear on the inside corner of the eye and below the eyelid. Milia are caused by dead skin cells that become trapped beneath the surface of the skin, forming a hard bump. If your bumps aren't milia, you could have pimples in the eye area. These may look red, black or have white tops. Milia can affect almost anyone. Though it's prevalent in babies, you may have milia as an adult. One of the best ways to stop milia is to prevent them in the first place, especially if you seem prone to bumps around the eyes. Using too many heavy skin products, such as lotions, creams and makeups, can sometimes exacerbate the problem, according to DermaDoctor.com. Look for lighter products that specifically say "non-comedogenic" on the packaging to ensure that the products don't clog pores. Wearing sunscreen can also protect your skin from bothersome bumps; they are more prevalent in people with sun damage. When evident on a baby's skin, milia typically go away on their own, says MedlinePlus. If you suffer from milia as an adult, schedule an appointment with your dermatologist. Typical acne products cannot help you get rid of milia. Your dermatologist can make an incision over the top of the bump to extract it as a form of treatment. Milia may look like tiny pimples, but don't treat them the same way you treat acne. Never pinch or squeeze milia, warns MayoClinic.com. You could cause irritation and even skin damage. Never attempt to cut your skin in order to remove the milia yourself. Only your dermatologist is qualified to extract them. What Are the Pimple-Like Things Under the Arm?